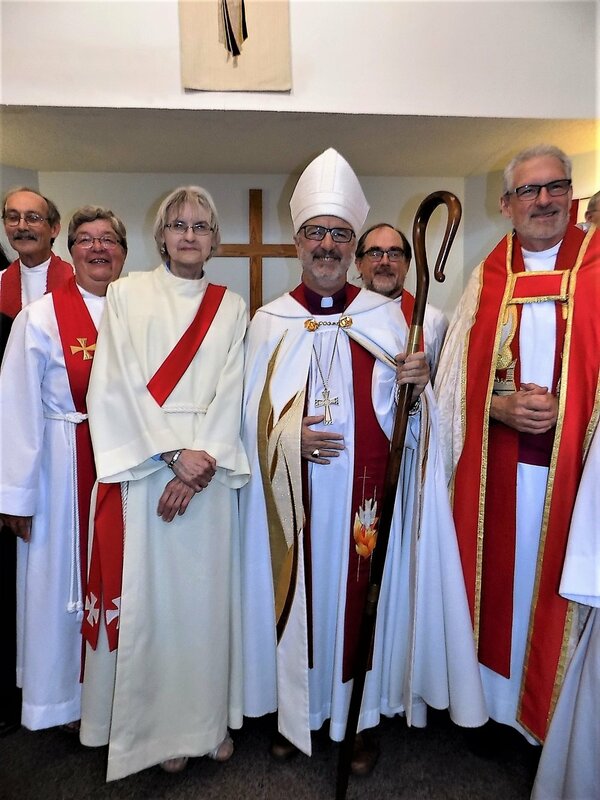 On a cool and wet Sunday afternoon on Aug 26th Karen Lorraine Walter was ordained to the diaconate in a joyous and festive service at St. Mathew’s Anglican Church, Sutherland by the Right Reverend David M. Irving, Bishop of Saskatoon. The Rev. Dr. Iain Luke, Principal of the College of Emmanuel & St. Chad provided the homily for the service. In the picture the newly ordained Rev. Karen (to the left of Bishop Irving) stands with bishop and the priests and deacons attending the ordination service. Closeup of the newly ordained Rev. Karen Lorraine Walter and the Right Reverend David M. Irving, Bishop of Saskatoon with the Dean and other clergy of the diocese after her ordination to the diaconate on Sunday, Aug 26th at St. Matthew’s, Sutherland.